The dawn of the 20th Century brought a new, modern dance to match the wild new rhythms of Ragtime. It had none of the complicated footwork of a Victorian ballroom. It was the One-Step and it was so called because it was just walking. Modern dancing as it was then called, gave dancers a freedom to strut, wiggle, cuddle, and carry on in an uninhibited, undignified and often deliberately silly manner that would have been unthinkable a few years earlier. The dance of the Ragtime era was unapologetically fun. 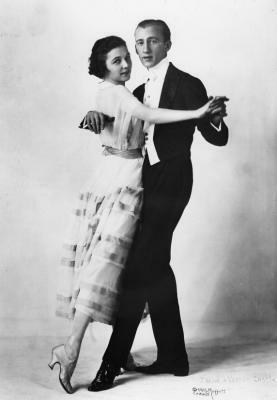 When the One-Step arrived on the scene around 1911, (displacing the Two Step as the go-to dance) it made dancing even more accessible to busy modern people who didn't have time for dancing schools, and provided a platform for all sorts of faddish variations like the "animal dances" ("Grizzly Bear", "Fox Trot", "Turkey Trot", "Camel Walk" etc.). Most new fads were just a One-Step with a special routine or step thrown in at intervals, or a modified hold (a bear hug or arms out to suggest an aeroplane etc.). Other than being in 4/4 time (fast, slow or somewhere in between) no special music was required, and one couple could be doing the Grizzly Bear, while another was doing the Camel Walk and another was just doing a simple One-Step without variations. All would share a dance floor and dance to the same music as everyone walked or slid or hopped forward, backward, or in a circle, and assumed a variety of postures - and each would be as wild or as silly or as dignified as their own tastes dictated. The famous dancers Vernon & Irene Castle came down on the side of dignified: as seen from their list of common practices of which they disapproved. You can, if you come down on the other end of the dignified spectrum, view it as a "to do" list. The Castles also propagated their take on the One-Step with the dignified but energetic "Castle Walk". Between 1914 and 1920, the name "One Step" gradually fell out of fashion, with the term "Fox Trot" morphing from a specific step to being a blanket term for all dances in 4/4 - displacing the name "One Step" though not the actual dance. The dance was remarkably unstructured. Dancers were inventing new variations on the floor, and a free and easy attitude prevailed. Without the limitations imposed by a specific step, almost any figure was possible; and if you thought a particular step would be nice for a change, there was nothing to stop you from throwing it in (Toddle, Turkey Trot, Slow Drag etc.) - and the films of the time show that nearly every possible variation and interpretation was present, simultaneously on the same floor. Everyone did their own dance, heedless of what the others in the room were doing. The One-Step with its infinite variations wasn't the only dance on the scene at the time, but its influence was felt in all corners of the ballroom. The Waltz continued in popularity, but more modern variations ("Hesitation", "Walking Waltz") were creeping in. The Tango arrived around 1912, but it too, much to the annoyance of purists, was generally danced in North America and Europe as a little more than a One-Step with a dramatic attitude. The Maxixe (pronounced Mah-sheesh), which was a predecessor of the Samba, was popular for a while and its rapid steps are, essentially, a very fast-footed, Latin-tinged One-Step with lots of bodily bends and wiggles. The Ragtime Era was a time of invention and experimentation, and there were new dance innovations and crazes almost every week, most of which had the One-Step as their foundation; but the basic One-Step was never displaced. Nearly every surviving film of people just dancing shows them One-Stepping, and the One-Step continued to dominate the dance floors of the Jazz Age, changing its name to "Fox Trot". The "ballroom position" of the time was evolving from the open frame of the Victorians to the intimate embrace of the Jazz Age, and both styles can be seen on the same dance floor - with the close embrace in the clear majority. There was a variety of hand holds, but the most popular was a fairly upright posture, close hold with the man's left arm (lady's right) extended out to the side (See the photograph). As you will see in the video, the "bunny hug" was also quite popular. This scene, from the Ernst Lubitsch comedy "Oyster Princess" (1919) is, of course, a work of fantasy, but the dancers seem to be doing a lot of standard Ragtime era dance moves, only in unison rather than "freestyle" as they would have been on a real dance floor. Note that they call it a "Foxtrot", because in 1919, Foxtrot was what anyone said it was, rather than a defined dance with universally recognized parameters.